The Kingdom of Denmark is a country in Scandinavia. The Vikings founded the Danish kingdom more than 1,100 years ago, making it one of Europe’s oldest continuous kingdoms. Copenhagen (København in Danish) is Denmark’s capital and largest city. In centuries past, the Danish monarch at times ruled all or parts of both Norway and Sweden, as well as the island nation of Iceland. Today, Denmark is a small country that occupies most of the Jutland Peninsula, as well as the hundreds of islands of the Danish archipelago. 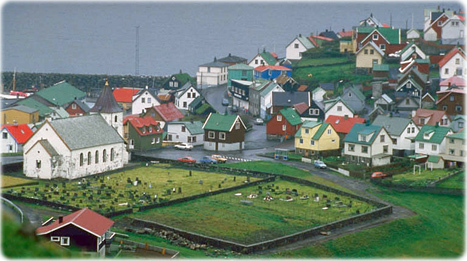 Denmark also includes the Faroe Islands, a collection of 18 islands that lie northwest of Scotland. Politically, both Greenland and the Faroe Islands are part of Denmark, but they are self-governing in all matters except defense and foreign affairs. Despite its northerly location, Denmark’s climate is relatively mild. The sea is never more than 64 km away, giving the country a seacoast atmosphere. Rain, fog, and gray skies are common. Country name: Kingdom of Denmark (local: Kongeriget Danmark). Government type: Constitutional monarchy . Total area: 43,094 km². It includes the island of Bornholm in the Baltic Sea and the rest of metropolitan Denmark (the Jutland Peninsula, and the major islands of Sjaelland and Fyn), but excludes the Faroe Islands and Greenland. Highest point: Yding Skovhoej 173 m.
Climate: Temperate; humid and overcast; mild, windy winters and cool summers . Administrative divisions: metropolitan Denmark - 14 counties (amter, singular - amt) and 2 boroughs (amtskommuner, singular - amtskomunes); Arhus, Bornholm, Fredericksberg, Frederiksborg, Fyn, Kobenhavn, Kobenhavns, Nordjylland, Ribe, Ringkobing, Roskilde, Sonderjylland, Storstrom, Vejle, Vestsjalland, Viborg note: see separate entries for the Faroe Islands and Greenland, which are part of the Kingdom of Denmark and are self-governing overseas administrative divisions. Terrain: low and flat to gently rolling plains. Ports and harbors: Aabenraa, Aalborg, Aarhus, Copenhagen, Esbjerg, Fredericia, Frederikshavn, Hirtshals, Kolding, Odense, Roenne (Bornholm), Vejle. Note: Denmark controls Danish Straits (Skagerrak and Kattegat) linking Baltic and North Seas. Population: 5,8 million (July 2018 est.). About one-quarter of the population lives in greater Copenhagen. Religions: Evangelical Lutheran (official) 74.8%, Muslim 5.3%, other (denominations of less than 1% each, include Roman Catholic, Jehovah's Witness, Serbian Orthodox Christian, Jewish, Baptist, and Buddhist) 19.9% (2017 est.). Ethnic groups: Danish (includes Greenlandic (who are predominantly Inuit) and Faroese) 86.3%, Turkish 1.1%, other 12.6% (largest groups are Polish, Syrian, German, Iraqi, and Romanian) (2018 est.). Language: Danish, Faroese, Greenlandic (an Inuit dialect), German (small minority). English is the predominant second language . Nationality: noun: Dane(s). Adjective: Danish. Copyright © Geographic Guide - Travel and Tourist guide. More in Europe: Austria, Belgium, Bulgaria, Malta, Russia, Monaco. Fredericksborg Castle, in Hillerød, Denmark. Built on three small islands in the 17th century, in Dutch Renaissance style. 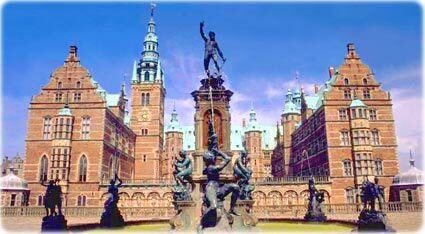 Today it is the national portrait gallery, with paintings of the royal family members, since the 16th. The small Town of Eidi, Eysturoy, in Faroe Islands.